This post was written for inclusion in the monthly Authentic Parenting Blog Carnival hosted by Authentic Parenting and Living Peacefully with Children. We hope you enjoy this month’s posts and consider joining us next month when we share about Peaceful Parenting Applied. Chances are, at some point or another, that tone has come out of your childrens’ mouths. You know the one. It’s the whine that grates on your nerves, making you want to pull your head inside your shirt, cover your ears with your hands, or leave. If you don’t deal with the whine, it just gets longer and louder and more, well, whiney. While you may find yourself wanting to walk outside and scream yourself, there are a few easy tips to keep gentle parents gentle at these times. Don’t take it personally. This may be easier said than done, especially if the whine continues to include your name. Personally, when I begin to hear the “Moooooooom,” it takes on an entirely new level for me. As much as we may feel disrespected or underappreciated during these times, our children’s behaviors are not about us. Define the cause. If the whining isn’t about us, what exactly is it about? That is the question of your day. You can’t begin to solve a problem if you don’t know what the problem is. Observe the situation. Think about what may be causing this seemingly annoying behavior, and set about making some changes. I know for my kids, whining signals that they are tired. We need to slow down, cut out some things, go for some quiet, easy going activities. Connect with your kids. Yes, your child is whining and the last thing you may feel like is being around them, but when your children are exhibiting behaviors such as this, it’s a cry for help. They need you. Take a deep breath. Remember how much you love your children, and be there for them. Perhaps doing something with your child will be enough to break them out of their whining ways. Actively listen. Everyone has bad days sometimes, and often we just need to have someone listen to us on those days. This is a great time to practice active listening so that your children understand that you ar ethere for them and that you really are listening. Set personal limits for yourself. It’s okay to say that you are reaching your limit and that you would prefer to be spoken to in a normal voice. If you are having difficulty understanding because of the whining, explain that you can’t understand what your child is saying and that you need to know what they are saying in order to help. Use play and humor. Try bringing a little levity to the situation by playing or using humor. When our children’s voices begin to take on that whining tinge, my husband has a difficult time understanding them. His go to phrase is “Hmmm. I couldn’t really understand what you said, but it kind of sounded like, ‘Daddy, you are the greatest! '” It hasn’t failed him yet. They will either laugh or take a deep breath to speak clearly. Take control of your actions and words. As much as the whining may be driving us a little batty, we are still in control of our own actions. We get to choose how we act or react. Remeber compassion. At the end of the day, think about the relationship you have with your kids. Every parent/child relationship is just taht – a relationship. remember to have compassion, both for your children and for yourself. 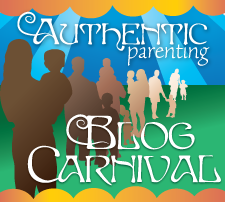 Visit Living Peacefully with Children and Authentic Parenting to find out how you can participate in next month’s Authentic Parenting Blog Carnival, when we discuss self-love! Dealing with Whining Compassionately - Mandy at Living Peacefully with Children discusses ways to deal with whining when it is getting on your nerves. Peaceful Parenting in the Light of Big Emotions – Laura from Authentic Parenting wonders how to resist being swept away from the storm of emotions in a sensitive child. How a peaceful parent speaks -Will the truth set you free? Shonnie at Heart-Led Parenting tells how being truthful (and more) in the way she talks to and about her daughter has helped create more peace and joy in her home. To Sleep, Perchance to Sleep – Mercedes at Project Procrastinot expounds on the difficulties of sleeping when you’ve got new twins by your side. Hitting and Peaceful Parenting – Susan May at Together Walking writes about her son’s recent “hitting phase” and how they were able to navigate it without punishing him. Peaceful parenting in action: the importance of realistic expectations – Tat from Mum in search shares a few examples of how knowing what to expect from your children can make your day a whole lot more enjoyable. Success Through Encouragement – At The Squishable Baby, Lisa discusses how she helps her child be successful through encouragement. Do you have blog posts about peaceful parenting or are you looking for some tips? This month, Authentic Parenting and Living Peacefully with Children are hosting an Authentic Parenting: Peaceful Parenting Applied link up! Check it out and help build a resource for parents striving to parent more peacefully. Great points Mandy! I love this post. Especially being that I’m with the kids everyday for 18 hours straight. Oh boy, have I ran into whining. I am going to employ some of these strategies. On another note, my linky isn’t working. I copied and pasted it, but when I press on the links, it just links to my own blog???? Would you have any insight? I’m not sure. I just tried on your site and the links don’t work for me, either. Can you go in and look at the code to see if your site somehow switched the links? Sometimes I have wacky things occur. Prevention is definitely key, but sometimes life gets busy and then you realize after the fact that, in my case, life has been too busy and someone needs some more sleep. The image particularly fit for me, as my child who is having the most issues with sleep right now is my most LEGO obsessed child. Thank you for this! My husband just went away for work for six weeks and the transition is always full of that noise. You helped me remind me to actively listen. Thanks for this practical article, Mandy! I especially love the reminders to actively listen and use humor. I’m sending this to a friend who recently asked a similar question and seemed to me to get more “traditional” advice. I love this too Mandy! Connection has taken on whole new meaning to me lately – I’ve realized that when I’m connected with my kids and family that everything else flows freely – and when I’m not connected the opposite is true – the flow is almost assuredly blocked. I do find that sometimes I don’t *feel* sympathetic and don’t necessarily want to sit, listen, and connect – but I find if I remind myself of my love for my child then I can at least “fake it” for a while and it is almost as effective. They still recover more quickly (well from my perspective anyways) and also after a while I truly *do* feel the love and compassion come back. Thanks for sharing! I love all of this wisdom and experience being shared. The more people hear it from different people in different ways, the more the message can spread! Oh yes, i know that tone only too well. I like that ‘Daddy, you’re the greatest line’, now I can’t wait for the next whining session to try it! I love your husband’s response! I’m sure this will come in handy soon. I also appreciate the advice of connecting and actually listening. Reframing what is going on can really help our reaction to the situation.